Singapore – the Lion City has endless attractions and activities to offer travellers of every age. However, being expensive than the neighbouring countries like Indonesia, Thailand and Malaysia, it is imperative to know about the things you can check out for free in Singapore. The most important thing is a visit to Singapore Visitor’s Centre located on Orchard Road. Here, you can update yourself with the latest festivals, events, concerts and things happening in Singapore during that time. Here, you can also load yourself with city maps, brochures and information. Once you get access to the map of Singapore, pull on your comfortable shoes, get your camera ready with full battery and head out. Apart from your Singapore tour package, here are some things that you can enjoy for free in Singapore. Transforming Singapore from ‘Garden City’ to ‘City in a Garden’, Gardens by the Bay is the most distinct addition to the Singapore skyline. The biggest attractions are the Supertrees which will leave you spellbound by its beauty and the things they are capable of doing; like absorbing solar energy to light themselves at night, harvesting rain water for surrounded flora and fauna, etc. Spread across 101 hectares of area, you can enjoy a visit (in the outdoor area) to this man-made marvel for free. Spread across 74 hectares of area, Singapore Botanic Garden is an excellent place to laze around, know about different varieties of flora and fauna and much more. It is the only botanic garden in the world which is open from 05:00 am till midnight on every single day of the year. With no admission fee, you can enjoy multiple scenic attractions like Rainforest area, Evolution Garden, Ginger Garden, Botany Centre and Tanglin Gate, Jacob Ballas Children’s Garden and many others. The most iconic sculpture of Singapore, Merlion (8.6 meter tall mascot, a half-lion, half-fish creature) makes an excellent photo-buddy. 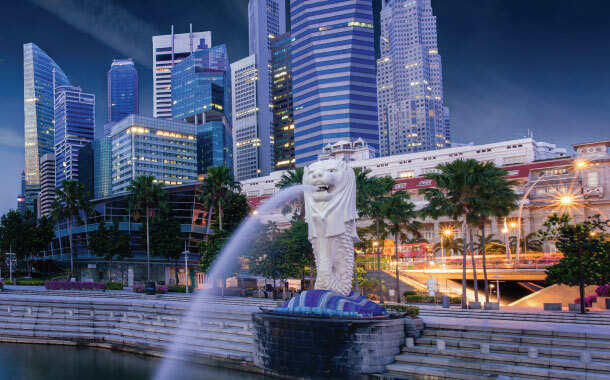 You must witness the city skyline from the Merlion Park as it is the best spot to simply sit back and enjoy great views of the bay and few of the city’s top landmarks including Marina Bay Sands and Esplanade. Take a stroll at the Marine Bay area to experience the charismatic views of the city’s skyline. On weekends (Friday, Saturday and Sunday), you will witness the skyline dancing in colourful lights for 13 minutes. Known as ‘Wonder Full’ starting at 08:00 pm, you can enjoy this show for free and grabbing the best of seat along with riverfront. Every weekend (Friday, Saturday and Sunday), the famous Esplanade presents free outdoor concerts right on the outstanding harbour area. Being the new iconic durian-shaped icon of Singapore, the Theatres on the Bay in Esplanade showcases free entertainment on regular basis presenting local bands and artists. Offering an India experience with a Singaporean touch, you must take a stroll along the Little India area. You will come across multiple shops, Hindu temples, fruit and vegetable vendors, food stalls and even local handicrafts. On the other hand, for Chinese experience, visit the vibrant Chinatown to come across Chinatown food street, night market, Chinatown heritage centre, shopping complex, shops, bars, restaurants and much more. The famous Buddha Tooth Relic Temple, Sri Mariamman Temple and Jamae Mosque are also in this area. You can also opt for a free tour of Baba House near Chinatown to get an insight into the life of a rich local family during the early 20th century. For more ideas to explore Singapore, browse through our Singapore tour packages and go ghoomne now.